On https://btycreative.flywheelsites.com I am having issues with the dropdown menu that should be coming from case studies. Whenever I hover over it nothing happens. I have read through all of the possible settings multiple times and can't find what is going on. Any ideas? thanks for your help! If you still have problems kindly get back to us with the login information of your WordPress dashboard using the secure note functionality of the post, to check the case closely and suggest you correct setting. Unfortunately my settings seem to match what you noted to do. I attached login information to original post and marked private. Let me know if that is now working for you. If you could also suggest how to have the mobile menu be more "traditional" with a hamburger menu rather than the side scrolling that occurs that would be greatly appreciated. You enabled Content Scrolling for your Bar 3. 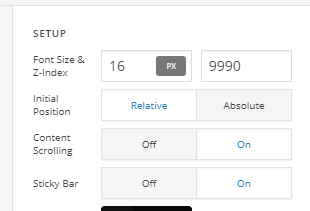 On The header builder the responsiveness is not automatic as on the legacy menu. You need to adjust the visibility of the elements according to the desired layout on desktop and mobile. So each BAR, Container, Element on the builder has a customizer tab, on this tab you can hide or show elements according to the screen width. I see-- thank you. I have set it up, but I can't get the menu dropdown on the Case Studies tab on the Modal Popup. I looked for the setting that fixed the other one and can't find it. I would also like help with the dropdown on desktop. It looks like the secondary menu bar is covering part of it. I have lowered the Z value on the secondary bar, but it is still happening. The first option, Karoo (or maybe CommZoom) is covered still. I can't find Z value option on the dropdown from the primary menu bar. The Modal Pop Up does not support sub menus and only shows the root ones. You will need to use an alternative element such as Collapsible Navigation.